This project is a bit of a mess. 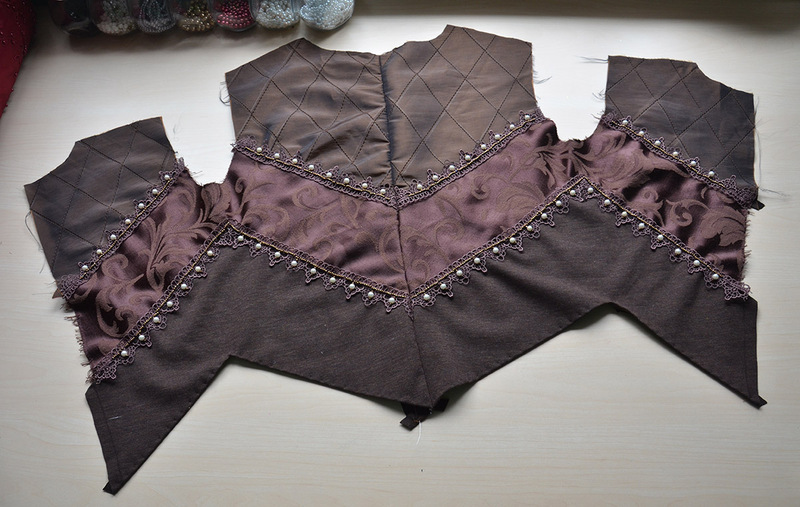 I originally wanted to make a Renaissance doublet but I also really wanted it to have tabs, which is more of a 17th century thing (seen here). It ended up being a combination of both, which is kind of weird, but I like how it looks! 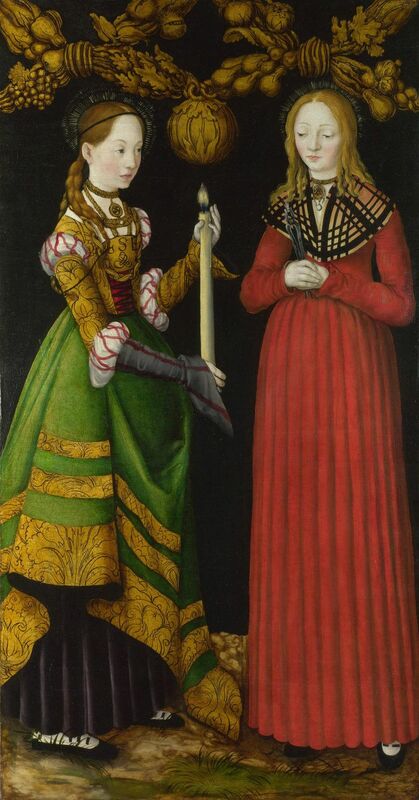 This idea began as side project to a brown renaissance dress which is loosely based off of this painting. 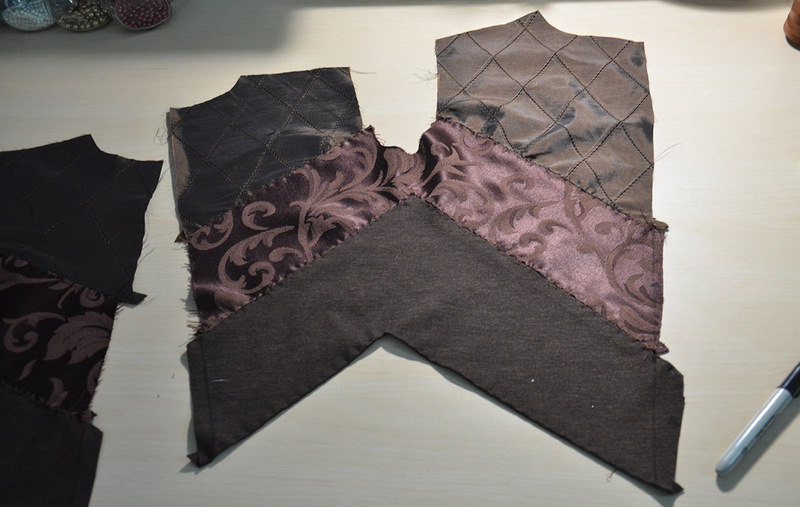 But I was in the mood to make something structured, so the doublet became my first priority. 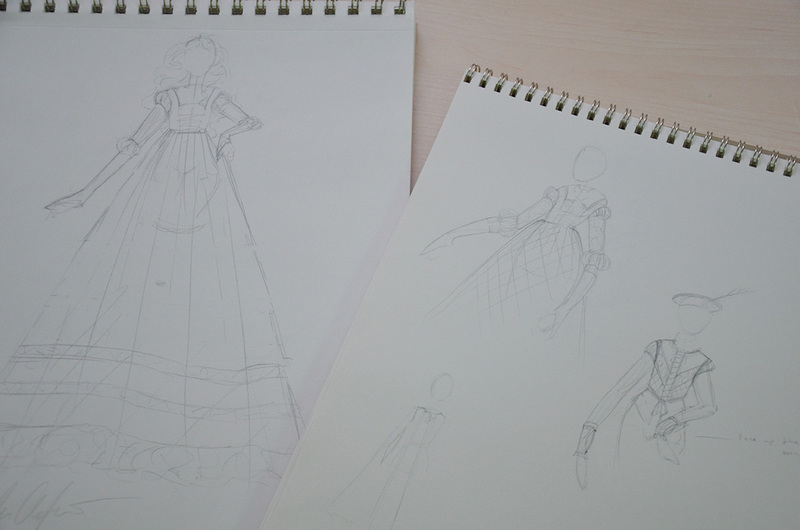 The dress will get made later on. I’ve been collecting fabrics for these projects for a while. 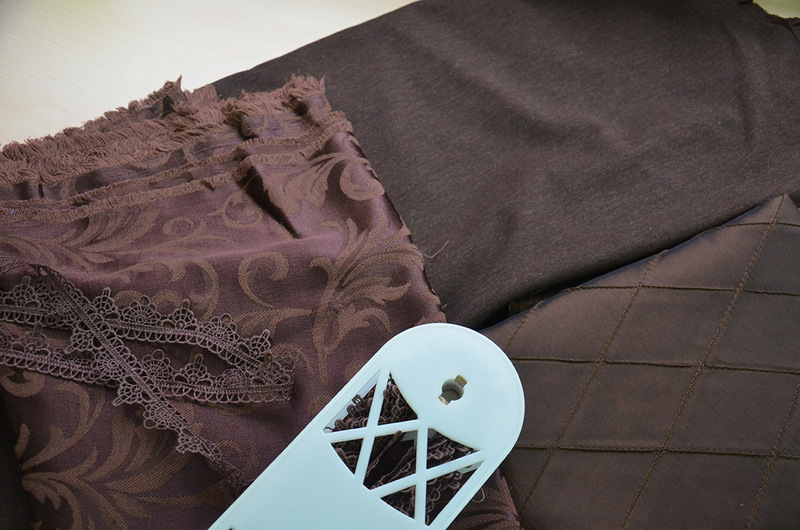 I bought some brown stretch fabric last year for another project but the jacquard, brown trim, and taffeta are all materials I bought to match it. 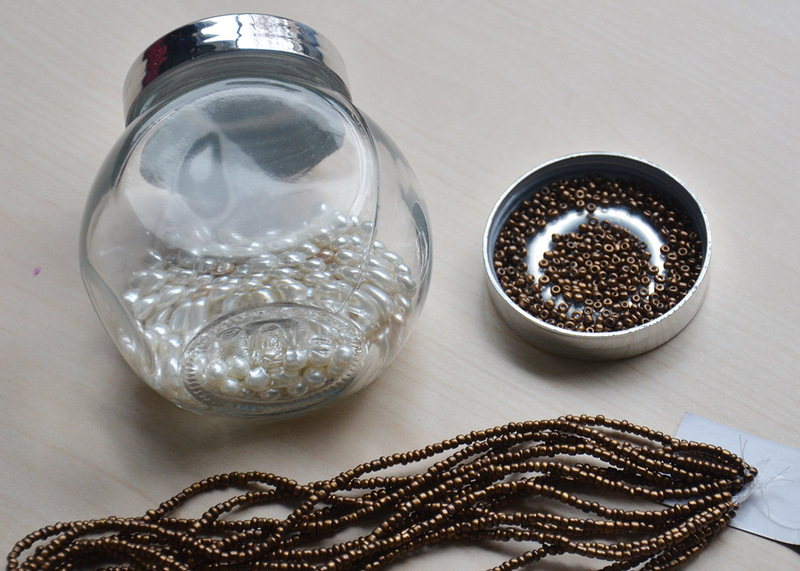 I also ended up using some trim from my stash, ivory glass pearls, and some small seed beads. 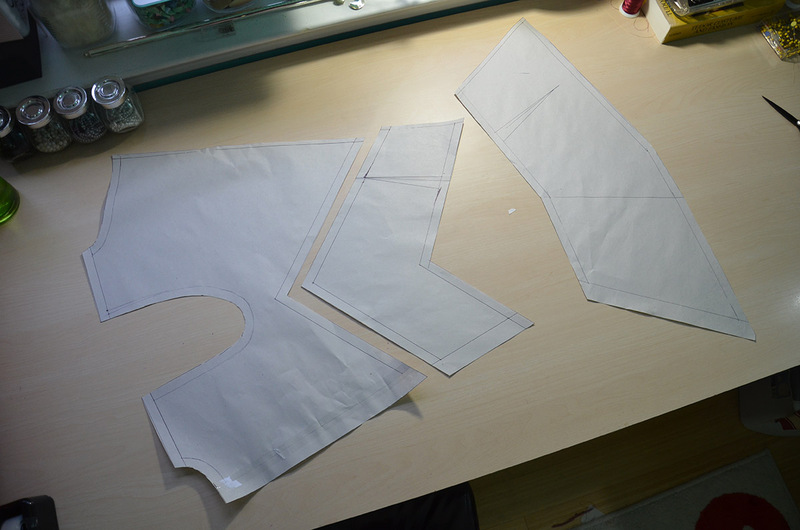 The first step was drafting my pattern. 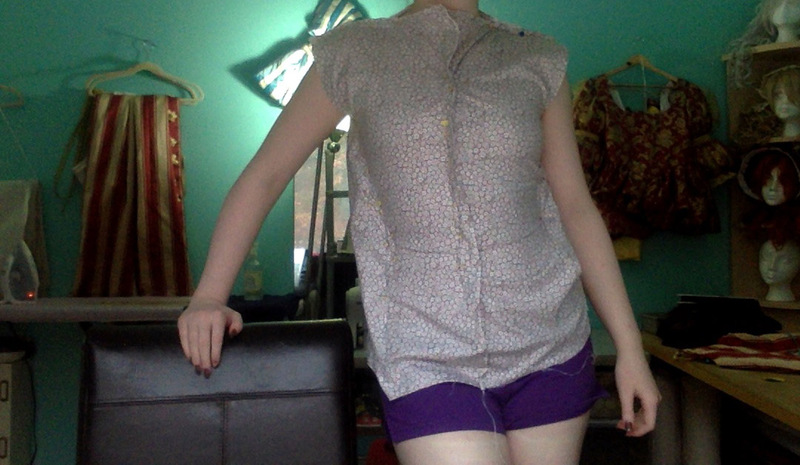 Since I wanted this to have a flat front I decided to sew it without bust seams. Draping a pattern like this on my dress form is very difficult (unless it’s low cut) because my dress form has a very defined bust. So I decided to go back to the basic draping technique I used when I first started sewing: The bag method. In case you are unfamiliar with this I shall enlighten you. 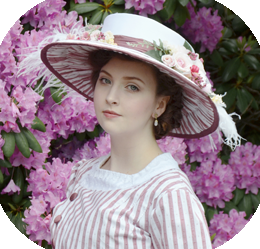 I started out with a piece of fabric that was big enough to fit over my shoulders and hips. 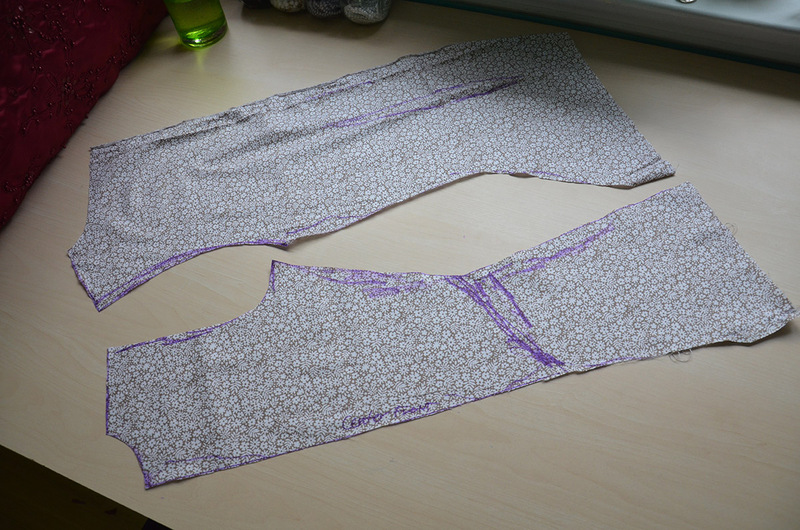 I sewed it into a tube and cut two slits for “Arm holes”, if you are drafting a symmetrical garment the seam should be in the front so you can keep it (relatively) centered. Then put it over your head and pin it at the shoulders so it stays on. Now it’s time for pinning. I began by putting a few pins in on each side and tried to keep things even. 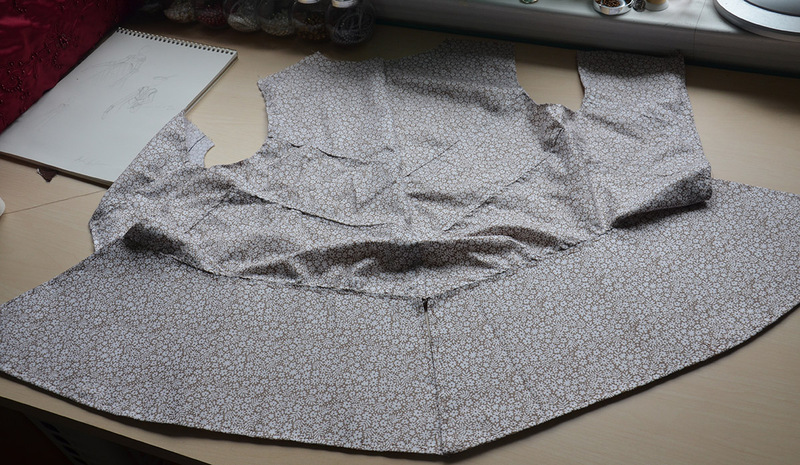 Then you add even more pins and do the best you can to shape the garment to your size. When you are happy with how it fits mark out the arm holds, neck hole, waistline, and any other details. Pick one side that will be used as your pattern and focus on it. 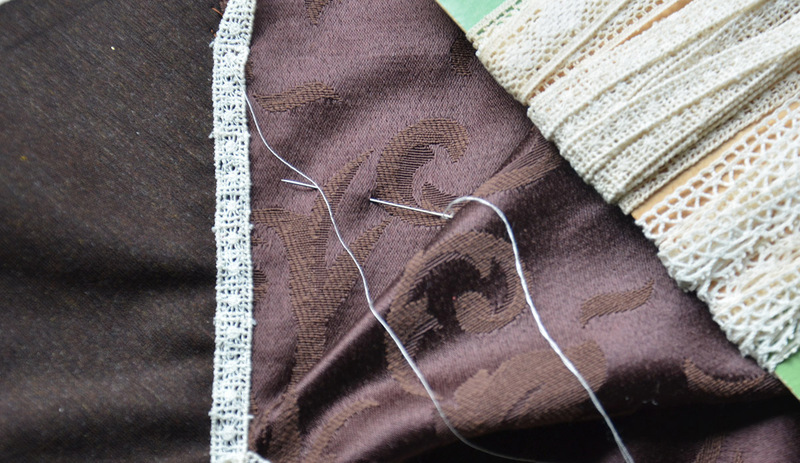 When you are done unpin yourself on one side (the side you won’t be using as a pattern) or cut yourself out of it. You’ll probably be left with something like this. Use a marker to go over the lines where your pins are, then remove the pins and cut along the lines you drew. Now you’ll have something that resembles a pattern! Since I needed mine to have a zig sag shape I ended up chopping my draft into pieces. Once I was happy with it I turned it into a paper pattern. 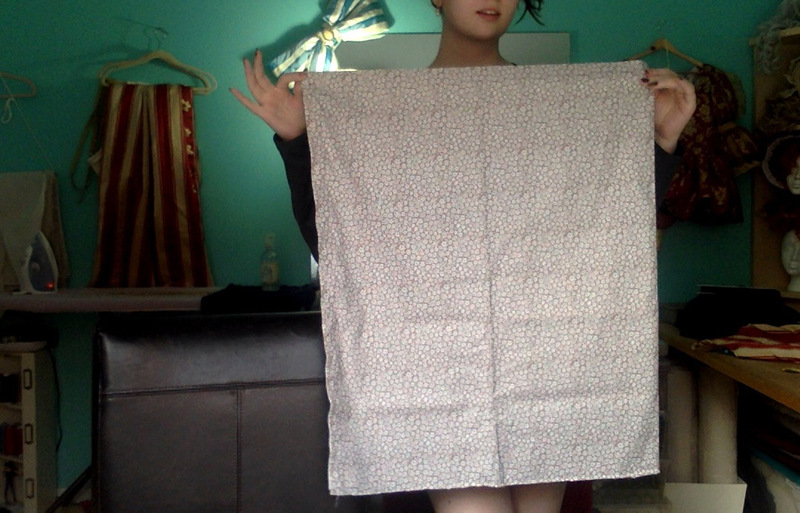 I used that pattern to make a mock up, which looked like this! All it needed was to be taken in at the shoulder and have a dart added in the back. 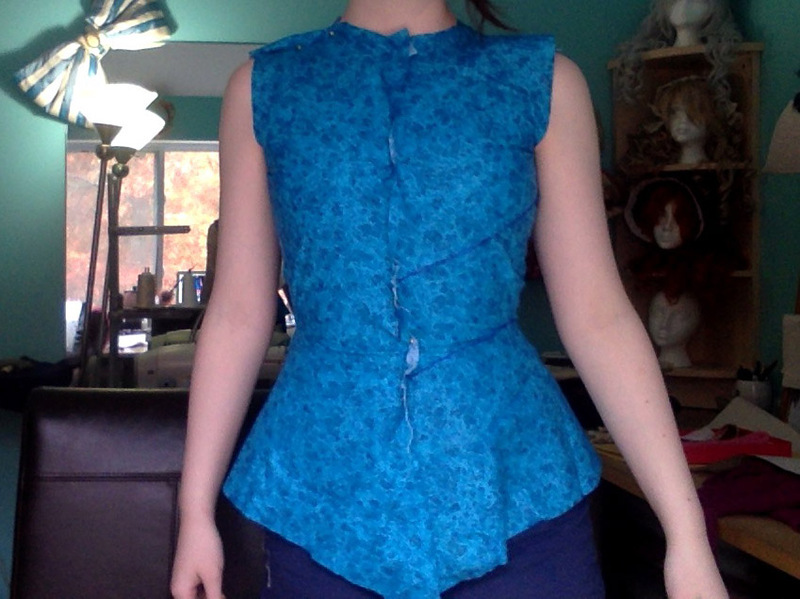 Once my pattern was adjusted it was time for cutting and assembly! 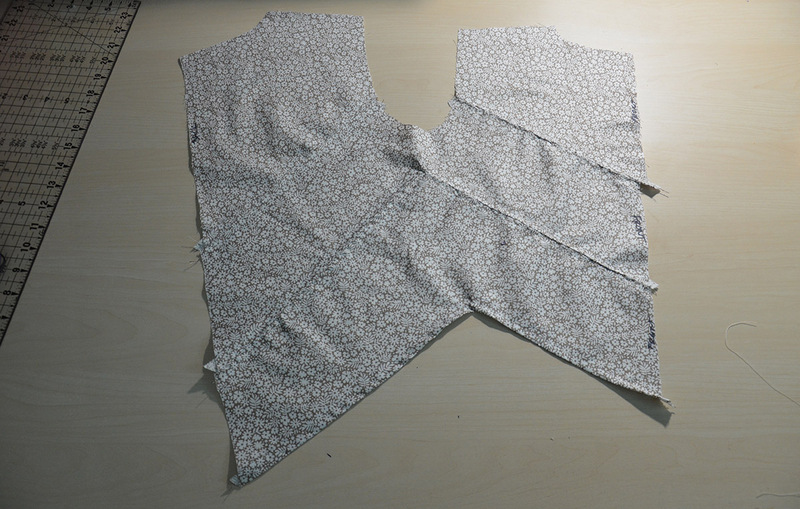 Since there are so many points I decided to hem each piece separately, then bind them together. This way I could have more control over corners and make things look smoother. 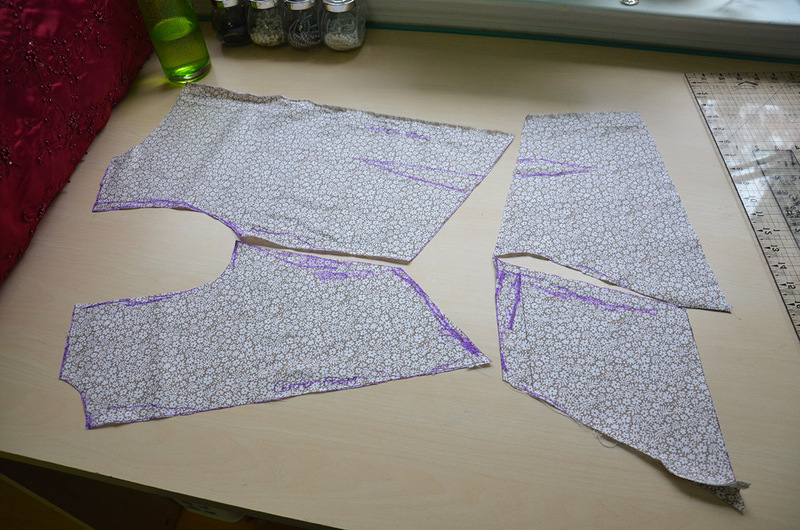 After I cut out all the pieces I marked out the hem, turned the edges over, and sewed them in place. 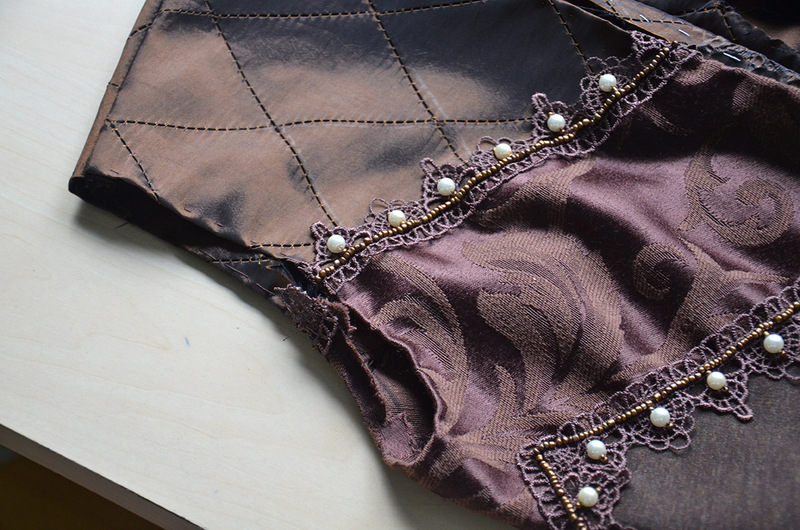 Once the main body of the garment was sewn together I started adding the details. 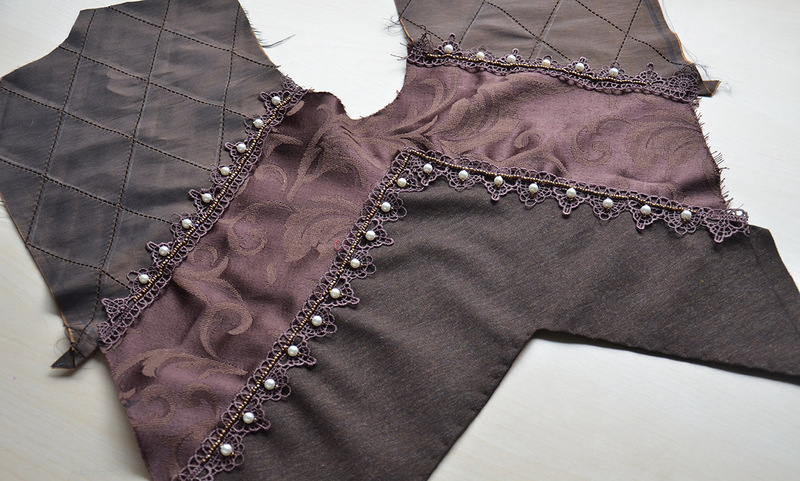 I debated about what to do for a long time and ultimately decided on using the brown lace to cover the edges, then beading it. It took a long time but was really easy to do! The beads used were 6mm ivory glass pearls and some glass seed beads from joanns. After beading both sides I sewed up the back seam. 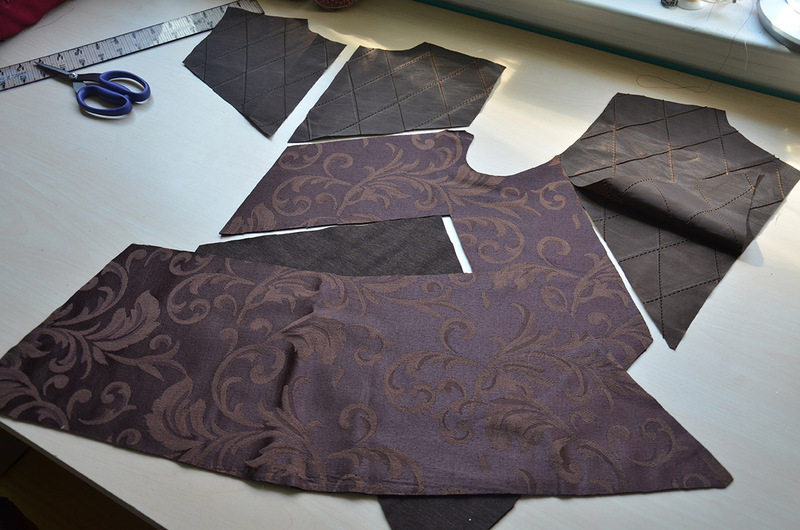 If I use this pattern again i’ll cut it without the back seam, because it sort of ruins the design for me. It would bother me a lot less if the pin tucks lined up, but I didn’t have enough fabric to make that happen. 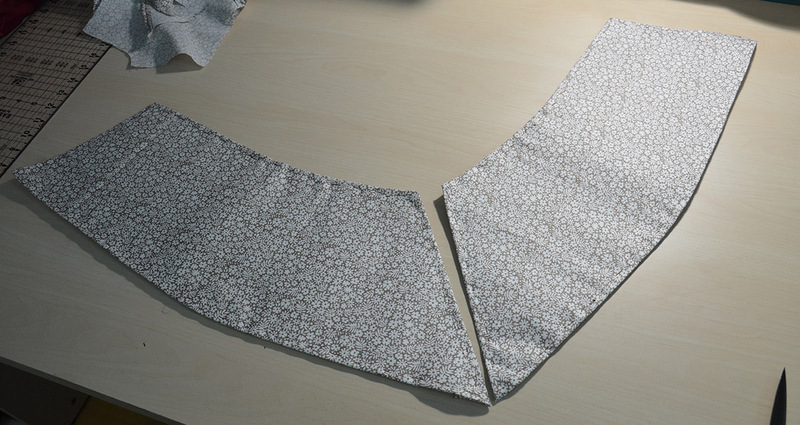 Then I sewed the lower piece on, i’m not sure what to call this part. I’m sure there is a proper term but I haven’t researched enough to find it! Then I added the waist ties. 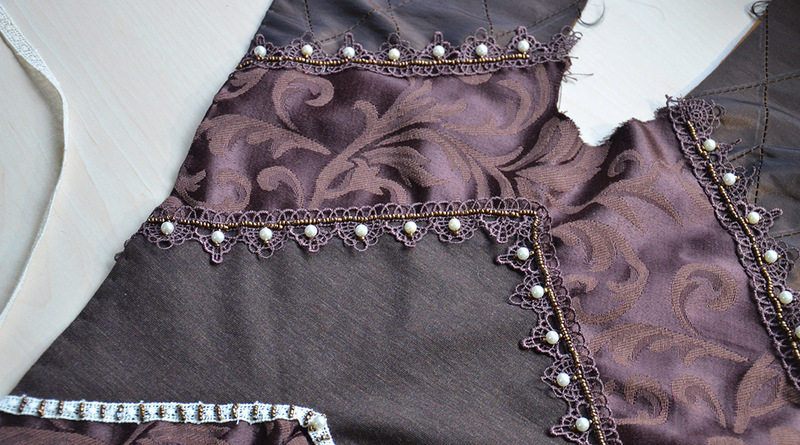 I debated a lot about what to add at the waist, I had originally planned on more brown lace but I didn’t have enough pearls to use the same beading pattern for it. I also had some ivory venice lace but it looked out of place. I finally decided on this small cotton lace! I think it’s just the right size and looks nice with the other materials. I tried a few different beading patterns but ultimately decided to bead it vertically which I think looks neat! When all the beading was finished I trimmed the front edge and rolled it over to create a finished edge. 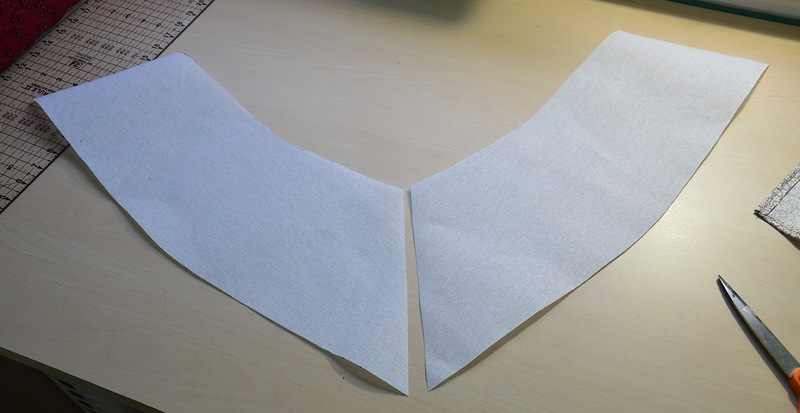 I also folded the arm holes over a half inch to create a hem. Now it’s ready for lining! 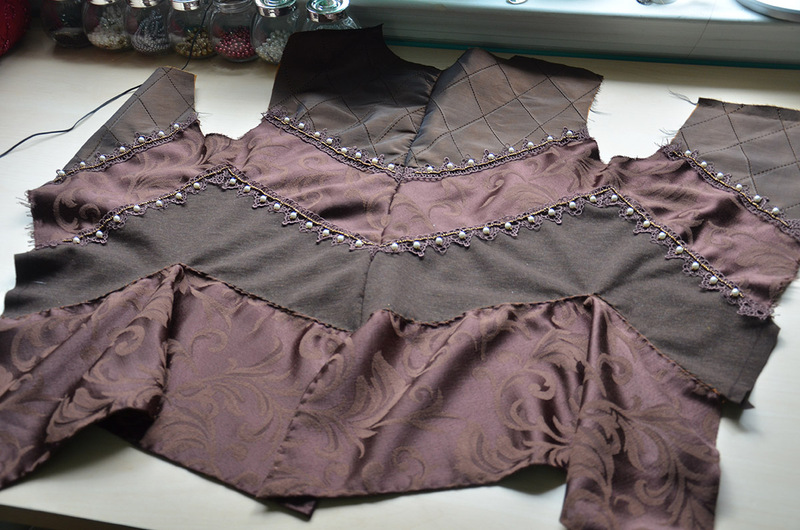 I made the lining the exact same way as the bodice…just without all the beaded details! All the pieces were cut out and the edges were marked. The edges were sewn over and the pieces were bound together. 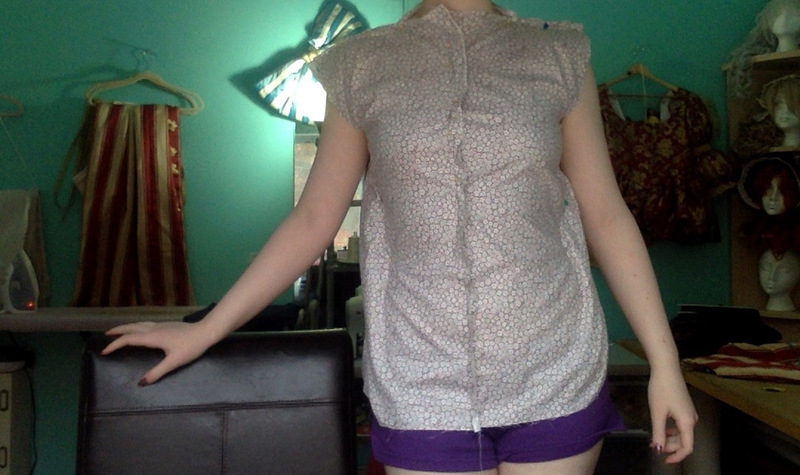 The lining looks much smoother than the outside because I used my machine for it and actually pinned things. 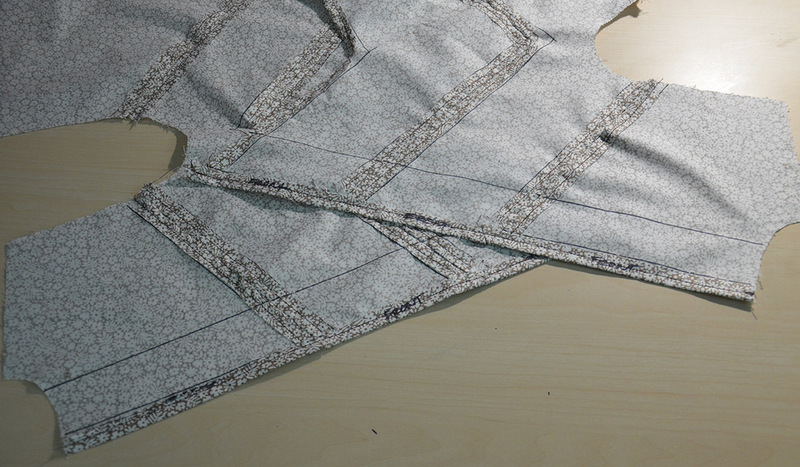 The lower piece of lining was stiffened with a layer of medium buckram. I used this to create shape in the finished garment. 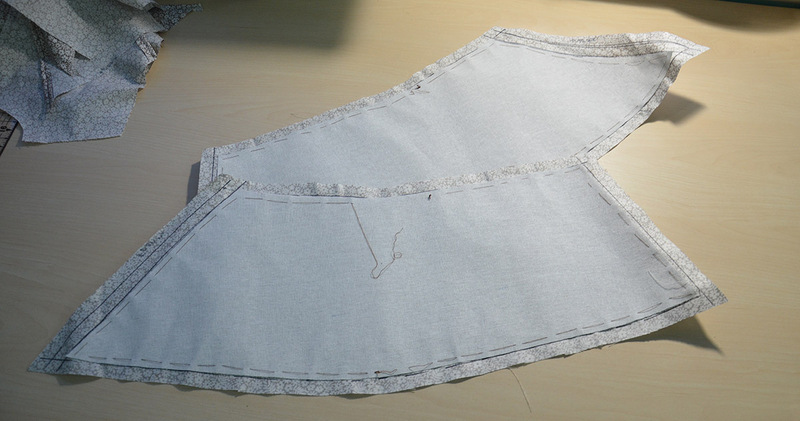 The buckram was basted down and then the edges were sewn over it. 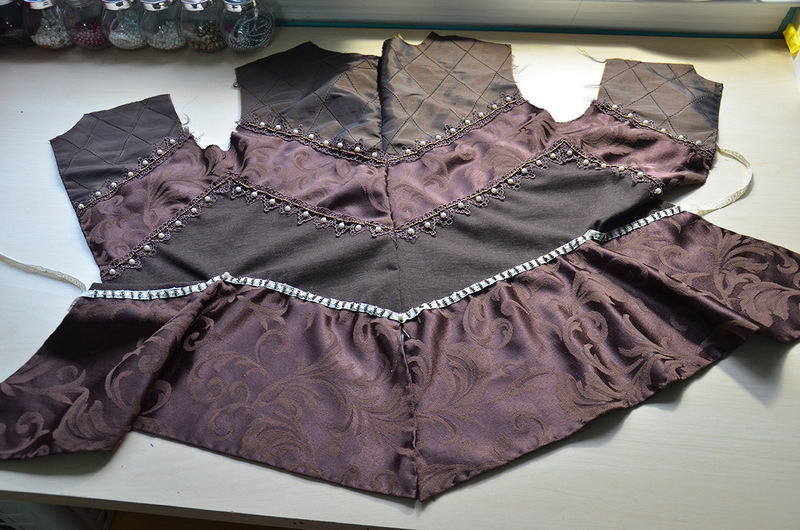 The lower piece was attached to the rest of the bodice. 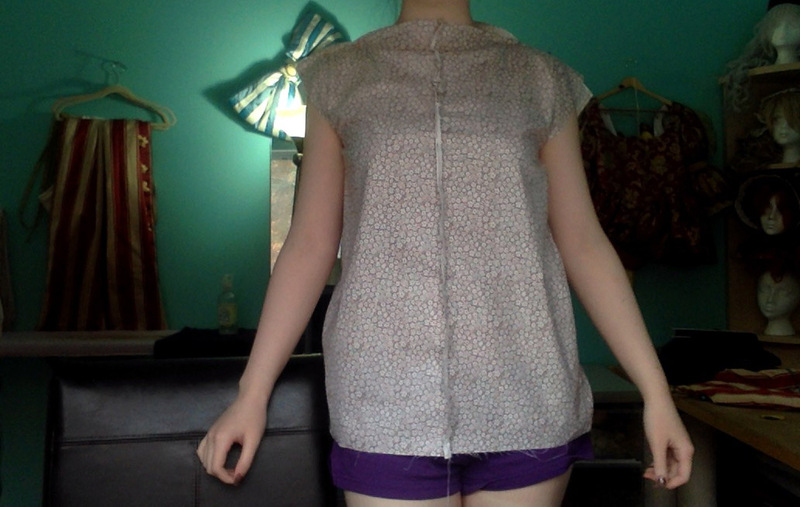 I also hemmed the arm holes and neckline of the lining. 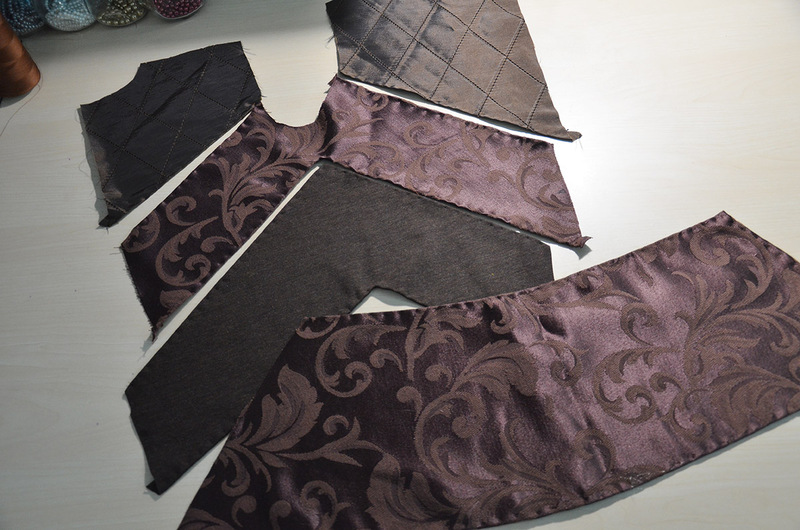 At this point the lining and bodice are both mostly done and ready to be sewn together. 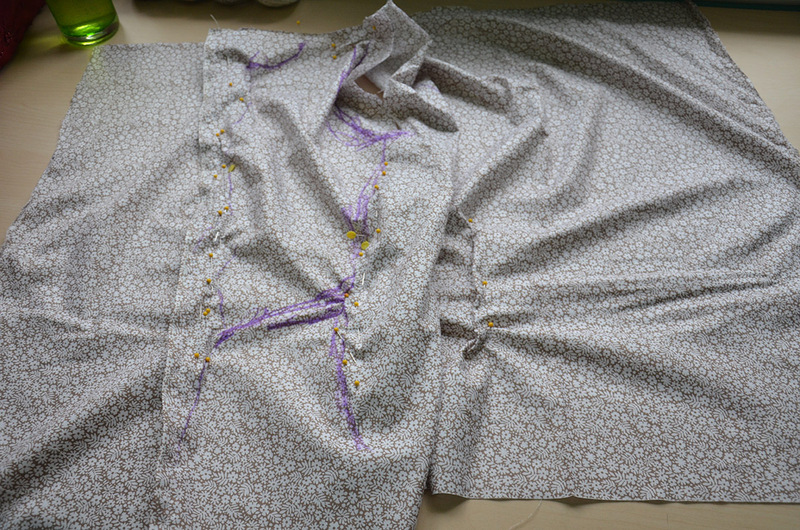 But the lining can’t be added until the sleeves are done, and the sleeve making process will be in another post! So this is all for today. Thank you so much for sharing that drafting tutorial! 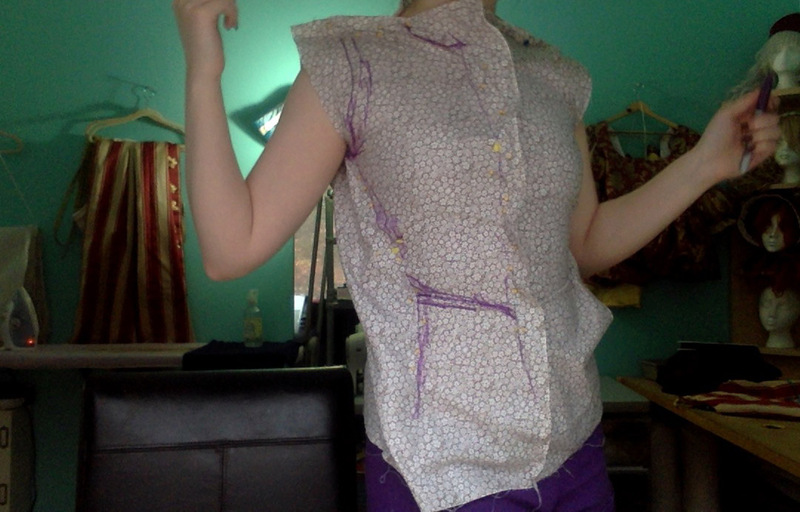 I did a fashion course and they would roll their eyes at not using a block pattern to draft from but it looks amazing! Doing this from now on, you cancel out any need for major fitting tweaks when you actually pin it in the first place! I’m glad it was helpful! Haha – i’m not surprised. 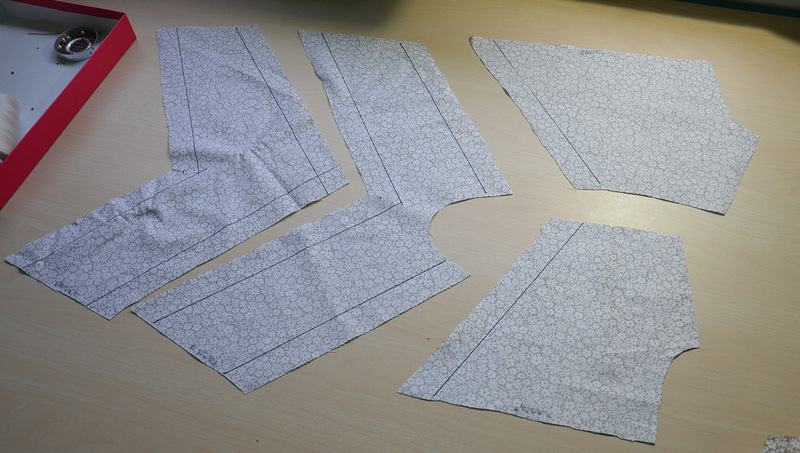 Flat/block patterning is a really valuable skill but it definitely isn’t the only way to make a pattern! Your a genius! Seriously talented I really enjoyed this post! I can’t wait to see the finished look! I love the way you pieced together everything! And I love love love the beading. Simple but packs a punch! the beading must have taken forever, but it looks beautiful! I an’t wait to see the rest of it! Thank you for the tutorial! I have not tried draping yet and am excited to give it a go! I love that the fabrics are totally different shades of brown but look gorgeous together. The beading is lovely too. Thank you for showing the draping and drafting! Though I’ve wanted one for years, I don’t have a mannequin, so seeing draping on a real person makes it feel much more do-able.